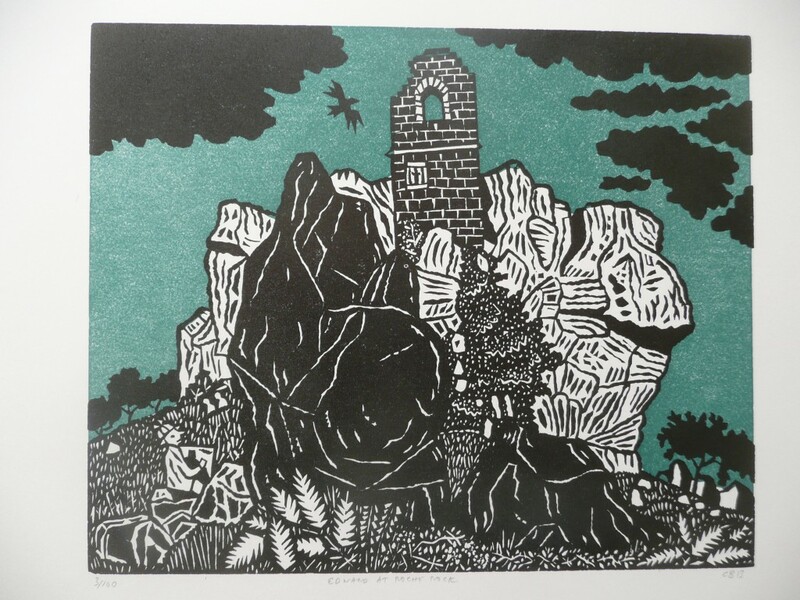 Dear Chris, I attach an image of a new linocut by Chris Brown, commissioned by Jennings Fine Art and being launched at the Edward Bawden exhibition at The Art Workers Guild. 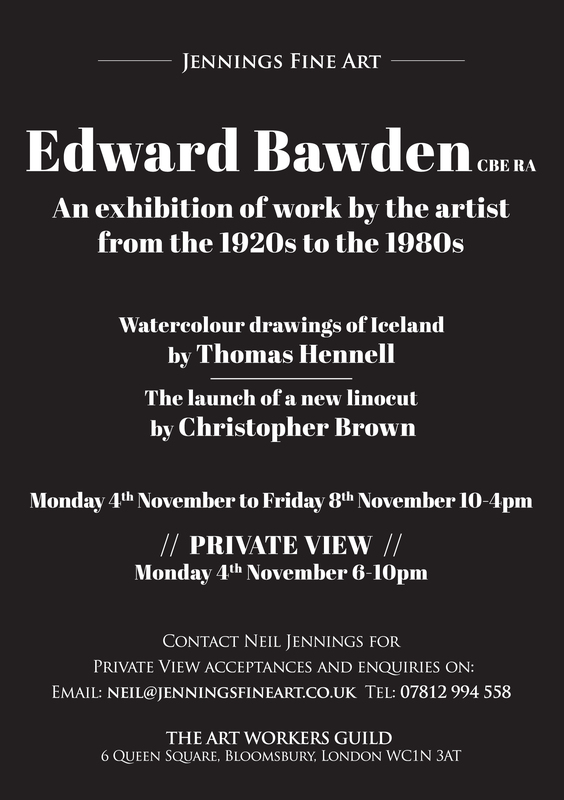 I also attach a lovely short essay by Chris and information & an invitation for the show. Roche Rock stands like an island rising out of a sea of bracken, heather and gorse, with it’s ruined chapel seamlessly blending into the rock on which it’s built. Little has changed since I first visited it with Edward in the summer of 1983. Though if my memory serves me well we parked a little closer. It was a stark contrast to the China Clay pits only a few miles away, (which was also a subject we painted that trip). The landscape there appeared almost alien, blinding white craters with pools of livid green water. Man had also left his mark on the landscape, rusting pieces of machinery and corrugated iron huts. Apart from Edward and myself the only living things we spotted were hordes of froglets migrating from the pool and the occasional buzzard soaring high above, a black shape against a bright blue sky. Edward knew what he wanted to paint that year – St Ewe church with its exotic palm filled graveyard, the clay pits and Roche Rock. We did however discover another subject, that of Poads Farm nestling beneath the china clay “mountains”. A brother and sister well into their eighties lived there, without electricity or gas and I’m not sure they even had running water. As with all his subjects Roche was “stalked” by Edward. We would arrive carrying our materials, sketching stools, flask of coffee, a packet of fig rolls, clamber over the stile, wade through the undergrowth and settle down to a morning’s sketching. Walking round trying to find the best viewpoint, he might perch on a boulder and quickly sketch, turn the paper over, move on to another view and continue until he found the perfect spot. Then paper firmly held by bulldog clips to his board he would refine the initial sketch and start to paint. Roche was an ideal subject, romantic yet not “picturesque”, with the rocks and foliage allowing him to explore patterns within nature. I struggled with my efforts, Edward’s work confident and relaxed, mine stilted and hesitant. During our coffee break we looked at our morning’s work, Edward was encouraging and gave me much needed advice “an artist shouldn’t try for very similitude”. Returning home after a day’s sketching to Mrs Collin’s B&B in St Ewe we would reflect on the day’s work. Edward welcomed my comments though often I felt ill equipped to pass judgment. It wasn’t until he returned home to Park Lane, Saffron Walden that Shelia Robinson would pass her critical eye and offer comments on his paintings. It was she among all his friends whose views he respected and advice he sought. A couple of years later Edward was asked by the Folio Society to illustrate “The Hound of the Baskervilles”. He was reluctant to accept the commission but I encouraged him, suggesting another trip to Cornwall to inspire him. He became excited by the prospect and even bought a deerstalker, (which he can be seen wearing in my print of Roche Rock). Although the rock itself doesn’t appear in any of his illustrations the landscape does, he illustrates the line “our friend Sir Henry, and the lady halted on the path” heavy clouds fill the top third of the image and Watson hides behind an enormous boulder, one which I well recognise from our visits to Roche. 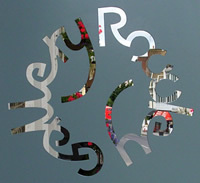 This entry was posted in Art, Places and tagged Christopher Brown, Edward Bawden, Neil Jennings, The Art Workers Guild. Bookmark the permalink.